They're going to pave paradise and put up a parking lot. It's no secret I really love abandoned buildings. Exploring and photographing abandoned buildings is one of my favorite things to do, even if I don't get to do it very often. However, as much as I love vacant buildings, it makes me even happier when they're preserved and converted into something new. 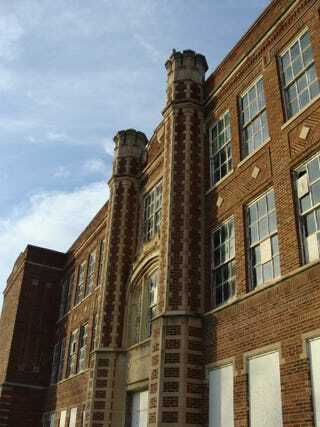 Today I found out that the city council has approved funding to tear down this huge old high school on the next street over from mine. It's quite beautiful (in its own way) and quite old, and it hasn't been occupied in quite some time. It's my understanding the interior is rather dilapidated, but it makes me really sad the city is just going to tear it down. The thing is, within the last year or so, it seems a lot of buildings have been torn down around here, but nothing is being rebuilt. There's quite a few empty lots around the town center now, and this place is small, so when something is gone, it's really noticeable. It's really weird to look around and see all of this empty space. Sure, some of these buildings were unoccupied, but they gave the town character. I don't really know where I'm going with this, but I just wanted to say a few words to commemorate an old friend that is going to be gone soon.